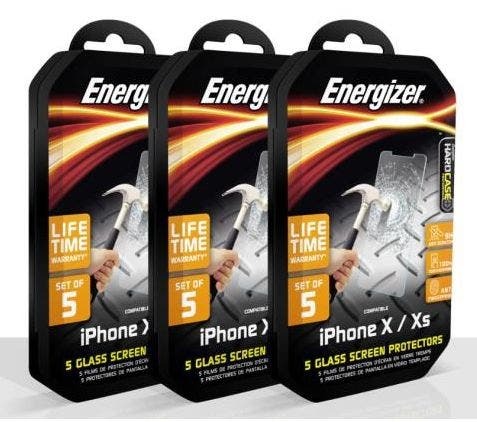 Following Apple’s reveal of the three new iPhone models, Avenir Telecom is excited to announce the release of an Energizer® range of lifetime warranty screen protectors and 2-meter shockproof cases, specifically designed to fully protect the smartphones. “When we heard Apple was releasing three new smartphones, we started thoughtfully engineering a range of protection accessories that would provide complete shock and impact protection.” says Jean-Daniel Beurnier, CEO of Avenir Telecom. “We worked on selecting high performance materials to reflect the strength of our Energizer® products, all while maintaining the beautiful look of the new iPhone models” added Beurnier. Designed to allow the consumer to experience both style and ultimate protection, Energizer®’s new case collection for the iPhone Xs, Xs Max and XR features premium resistant materials. Inspired by nature, the back of the case sports a honeycomb shaped design that ensures high shock absorption and an anti-slip grip. Made from high strength TPU and military standard certified, all three cases are reinforced at their corners, protecting the iPhone from drops up to 2 meters. To maintain the original look of the new smartphones and to complement their sleek design, the cases come in a beautiful matte black. The new line of screen protectors embodies Energizer’s DNA by using 9H-rated tempered glass that offers stellar screen protection to the three iPhone models. Engineered for maximum durability, the screen protectors are covered by a lifetime warranty. They come in a pack of five to allow easily replacing them over the lifespan of the new smartphones. Ultra-clear, really thin and 100% touch responsive, the Energizer® Lifetime Warranty screen protectors – meticulously cut to perfectly fit the screen of the iPhone Xs, Xs Max and XR – ensure a smooth tactile and visual experience. Lifetime Warranty screen protectors and cases are now available for order and will be available for purchase at the same time as the new iPhone models.